Situated in the inland desert valley of Southern California, Palm Springs is a destination that offers many attractions. Spend time at popular points of interest or plan a family vacation at Palm Springs. You either relax in your home away from home or enjoy excursions into the natural wilderness or explore the city's entertainment and cultural centers. Pick and choose activities for everyone when you start your day during a leisurely breakfast at Palm Springs vacation rentals. A diversity of activities awaits the entire family in the Palm Springs area. Take hikes in the foothills or ride up the Palm Springs Tramway for majestic views of the valley from the San Jacinto Mountains. In Joshua Tree National Park, the family can ride along in a jeep for a back country tour of the Colorado Desert and the Mojave Desert. The experience is unforgettable as the views can be stunning and the temperatures hot, but you can head back to cool off in the water and surfing atmosphere at Knott's Soak City Water Park. If Palm Springs California rentals are your choice of place to stay, you can head back to relax in a private space where the whole family can reflect on the day's adventures. When you stay at Palm Springs rentals, there's nothing to distract you from just staying in and cooking a meal. Downtown Palm Springs isn't far away and there is plenty to do on the outside if that's what you want. Opportunities for dining and shopping are plentiful, and you can find many souvenir shops and book stores in the city as well. There are also several spas to experience more physical relaxation, and cultural, art, and historical museums to feed your factual and artistic knowledge of Palm Springs. Theater and live music venues in the city can meet your need to be entertained. A vacation in Palm Springs can satisfy your interest in the arts very well. There are many art galleries to choose from, but dad can also wonder off to one of the area's 100 golf courses. The valley is known for golf worldwide and it is not hard to find a course and spend an afternoon on the links. Take the whole family for a walk along the Palm Springs Walk of Stars downtown and see how many names you can recognize. A wind energy farm is located just to the north of town, and tours are available to see just how the wind turbine generators work. Combined with everything there is to do, your stay at Palm Springs vacation rentals will include everything needed for comfort and relaxation. Plan a getaway at Palm Springs rentals soon, because there is nothing that makes spending time in a naturally, culturally, and fun-filled destination than having your own rental. Hotels and motels in the area offer a space the fraction of the size and take a higher cost out of your budget. Have Palm Springs California rentals as your home base so the family can enjoy a luxurious vacation in an area where all can satisfy any of their desires. 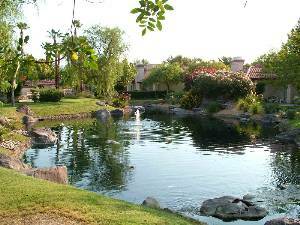 Check out nearby Indio , Joshua Tree , La Quinta , Palm Desert , Rancho Mirage , Sky Valley .